We began our fall reading period while hurricanes pounded the shores of Houston, and soon after, Puerto Rico and other Caribbean nations. Our hearts ached especially after the subsequent flooding displaced families and neighbors. One of our editor’s family member reported being still without power in Puerto Rico as late as Halloween. We cannot imagine the turmoil those storms have caused. So, as we are fortunate enough to bring you the newest stories, essays, and poems of the fall, we also want to say we picked these pieces knowing there is much work to be done in 2018. 2017 may be ending, but many events that took place will continue to influence the new year. New writing is what encourages us in aftermaths such as these. 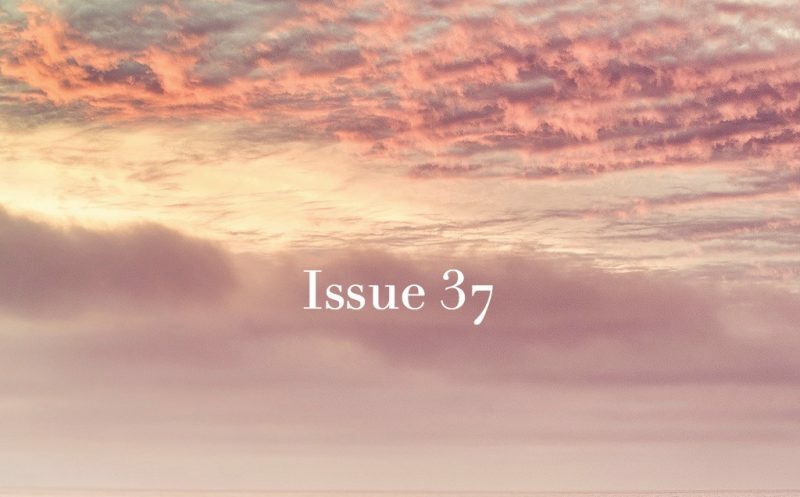 In this, our 37th issue, our editors were inspired by pieces focused on self-exploration through technology, intergenerational influence, eroticism, and nature. “Tyranny of Bounty” is a poem which questions how we harvest earth’s riches. The poem’s highly relatable situation made us more critical of our capitalistic relationship to nature. Our Pushcart Nomination, “Net_Work” is a story with such force and drive, much akin to the experience of being lost in our phones or the internet, and how these virtual relationships allow us to hide behind a screen. The essay “It Started with a Centerfold” explores how a mother and daughter react to a risqué 1972 Cosmopolitan photoshoot of Burt Reynolds with verve and humor. We also found solace and joy in new published works such as Hernan Diaz’s debut novel, In the Distance. Our reviewer noted how the novel “speaks to the isolation felt by many who, through immigration, are forced to confront the vast and foreign landscape of the United States.” As more changes to our immigration reforms were announced this year, we, too, couldn’t think of a more appropriate subject to be reading. While 2017 has been one of the more sobering years, we are excited to read the incoming submissions for our spring issue in 2018. This will be a mini-issue to say goodbye to out-going staffers and hello to new ones. Front Porch Journal has always been a student run journal in which the students have curated everything from the look to the picking of published pieces. Now, our staff is thrilled to be a part of a new Front Porch. We will be streamlining the journal in several ways: switching to Submittable, updating the features and look of our website, and focusing our attention to providing more resources to our writers, who are the most important aspect of any journal. For now, the submission process will operate in the same way it has in the past. We hope to see your submissions! We can’t thank you enough for sticking with us through the years, and we look forward to showing you what is next for us. May the new year bring you as much change as you can handle.